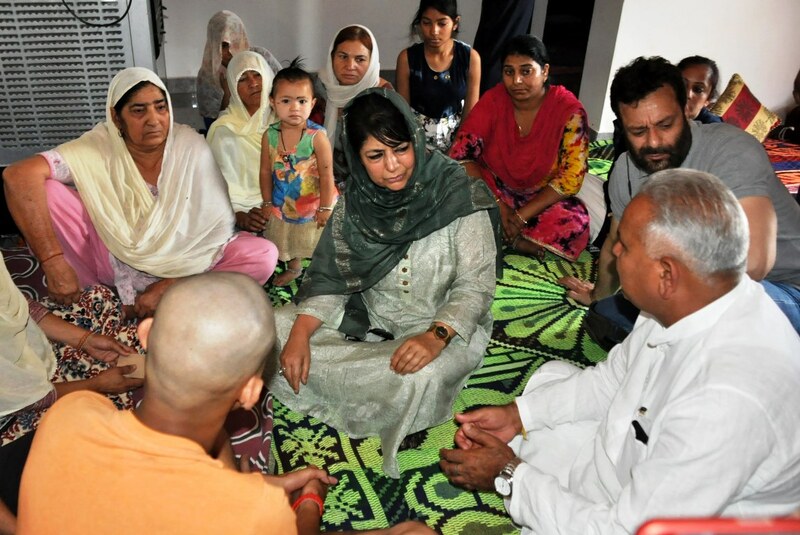 Chief Minister, Mehbooba Mufti on Friday visited the border areas of R S Pura, Samba and other places of Jammu province which have been severely hit by the cross-border shelling of past few days. She interacted with the affected people and took an on the spot appraisal of their difficulties and demands. Minister for Relief, Rehabilitation and Reconstruction and Disaster Management, Javed Mustafa Mir accompanied the Chief Minister during the visit. Interacting with the people, the Chief Minister said she is deeply distressed and anguished due to the continued flare up on the borders and sought an immediate end to it to save the people of border areas from more losses of life, property, and peace. She appealed the leadership of Pakistan to respect the sentiment of Ramadhan and respond positively to the Ramadhan ceasefire announced by the Centre recently. This, she said, has led people of the state to heave a sigh of relief and now the need is to extend this gesture to borders as well for which she asked Pakistan to respond positively. She reminded people that complete peace prevailed along the borders in the State for more than a decade after the ceasefire at borders reached at in 2003. Responding to the demands of the local people, Mehbooba Mufti announced that her Government would examine the demand of raising a battalion of JK Police comprising of youth exclusively from border areas. She also assured them that her Government would look into their demand of bringing people living in areas along International Border (IB) at par with those of LoC areas in terms of facilities, parks or any incentives. The Chief Minister also assured the people that steps would be taken to construct Border Bhawans in urban areas for the people of border areas where they can stay during the difficult times. She said her Government has already got the loss to livestock included in the compensation package by the Centre. Responding to other demands, Mehbooba Mufti said the local hospital at R S Pura would be inducted with more facilities in terms of equipment and manpower and also the local Veterinary unit would be provided more facilities. Minister for PHE, Irrigation & Flood Control, Sham Choudhary and MLA, Dr. Gagan Bhagat were present on the occasion. Later, the Chief Minister visited Samba and interacted with the people from border areas at Thandi Khui and Chichi Mata Mandir. Here also, the people of border areas raised similar demands and the Chief Minister assured to look into them. She also assured to look into the issues of late settlement compensation cases and early settlement of other compensation cases. Minister for Health & Medical Education, Dr. Devinder Manyal was also present on the occasion. The Chief Minister also gave away Rs. One lakh each to the kin of those killed in the cross-border shelling in these areas. This is over and above the ex gratia extended to them by the Jammu Divisional administration already. Chief Secretary, B B Vyas; Director General of Police, Dr. S P Vaid; Principal Secretary, Home, R K Goyal; Principal Secretary to Chief Minister, Rohit Kansal; Divisional Commissioner, Jammu, Hemant Sharma; IGP Jammu zone, SDS Jamwal and senior officers of Divisional and district administrations also accompanied the Chief Minister during the visit.